NIAGARA — Ever since his youth Hal Wentzel has dreamed of owning his own apple farm. In 2002 him and his wife committed to the now popular Apple Orchard in Niagara Wisconsin. While Hal focuses more on apple farming, Carol takes charge in the bakery. “It’s kind of like a little competition between Hal and I, who’s going to outsell. Are you going to sell more apples, then I’m going to sell more bakery. Well we’ll see,” said Carol Wentzel, Owner. This has been the best season for apple picking so far. The trees have come through healthy and the weather has been cooperating. “The apples are showing just wonderful size, color like I have never had before. This is really an outstanding year. With all the heat that we’ve had, everything’s early this year from a week to 10 days early,” said Hal Wentzel, Owner. The work for Apple Season starts at the end of February with pruning the trees. “I’ll come out here for a few hours put on my snow shoes if I have to and prune my trees. It’ll probably take 6 weeks to fully prune all of the trees,” said Wentzel. But it doesn’t end just there. “Next step will be right after the fruit set, we will go to bloom. Hopefully the bees will pollinate well like they did this year. Then I have to thin the crop. 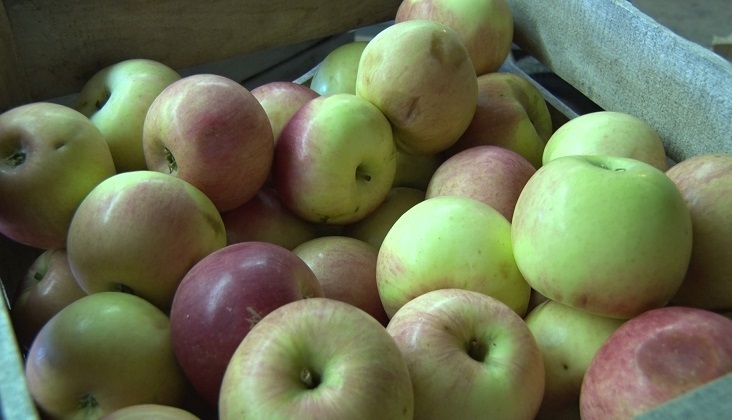 If you have too many apples on the tree, the apples will be small and they wont color up nice,” Wentzel added. In about week people can start picking the traditional Honey Crisp, Mcintosh and Courtland apples. “The front colors or the four colors what I like to call it will be red. The background colors starts out as green, then turns to a yellow and then finally to gold. When that background color goes from green to yellow gold, most likely that apple is ready,” said Wentzel. And there will be plenty of everyone’s favorite kind of apple. “We have a total about 2,200 trees and probably 850 of them are honey crisp. So we will have plenty of those this year for picking,” Wentzel said. Besides their Orchard, and made from scratch bakery. They also have goats, pigs, and sheep that you can feed apples to.